The Knights celebrate the fall of a crucial wicket. Kolkata Knight Riders not only limited Mumbai Indians to a petty total but also trashed their bowling to win their opening game of the Indian Premier League's eighth season. Mumbai Indians were put into bat first by the mighty Knights who didn't allow the Lads in Blue to get off to a good start, planting pressure on the champions of 2013 in the infancy of the game itself. MI lost three early wickets of Aaron Finch, Raydu and Tare, which instantly compressed them as these three gave the MI team hopes of winning their opening game. Mumbai wobbled, but their skipper Rohit Sharma came and took the oars of the sinking ship and took them safely to the shore. Playing a Captains knock of 98(65), he along with Corey Anderson 55(41) helped MI to post a challenging score of 168 at the loss of 3 wickets at the end of 20 overs. The last over witnessed some wonderful cricketing shots from Anderson, 20 dire runs coming from the penultimate over was as angel in disguise for the boys from Mumbai. It isn't quite surprising that Rohit Sharma loves Eden Gardens as his highest Test and ODI score has been on the same ground and today he makes this ground even more special by adding his highest t20 score of 98 here. KKR's fielding wasn't up to the mark, dropping two catches in touchy situations cost them a lot, they grabbed a few early wickets but failed to convert the good start into a big one. The Kolkata Knight Riders recovered whatever they had lost in the 1st innings of the game, for KKR too their Captain engineered the innings with his knock of 57 runs, he was the backbone of the team and was supported by Surya Kumar Yadav 46(20) and Manish Pandey, and this trio guided the team to victory. Mumbai Indians had too many loop holes to cover up in the 2nd innings. They did not have an attacking bowling attack who could have pressurized the batsmen to play silly shots in precarious situations. Vinay Kumar was the most economical bowler for MI and they would want Ojha and Raydu to step up and hunt the opposition. Something that really surprised everyone was Gautam Gambhir's bat breaking into half at the root stage. A couple of catches dropped by MI, and it was startling to see the safe hands of Anderson and Tare miss important catches. 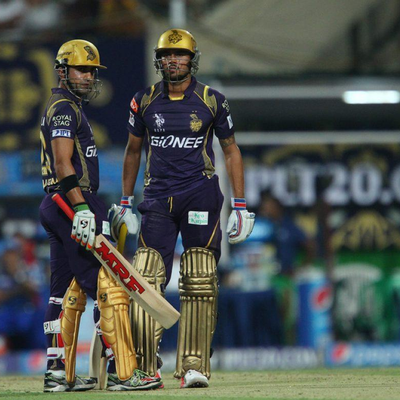 KKR played like Defending Champions throughout and dominated the Mumbai Indians, at the end the better team won! The man of the match award was bagged by Morne Morkle who bowled a wonderful spell.Kolkata will want to continue their winning streak while MI will go home and look for solutions on improvising their game plan. KKR take on RCB at the same venue on saturday while Mumbai Indians will enjoy the home crowd oxygen as they battle against the Kings XI Punjab on Sunday. Kolkata Night Riders top Mumbai Indians in the opener of IPL 8.